Learn how to use GREP to describe all items in a list that begin with the same letter, then insert a space between and/or add an alphabetical heading to each alpha group. Covers GREP Find/Change, wildcard/location/found text metacharacters, character sets, marking subexpressions, and backreferences (an undocumented feature). Watch the episode here (23:22), or you can subscribe via iTunes. A brand-new, two-part video series I recorded for Adobe TV launched today. It takes an in-depth look at the new features in InDesign CS 5.5 (and some improved older ones) that make the entire InDesign-to-accessible-PDF process faster, easier, and more reliable. Part I explores the new features that greatly reduce the time and number of steps involved in creating accessible PDFs—setting up a content order in the new Articles panel, creating anchored images within a text flow, applying “Alt” text and tagging instructions to images, and mapping paragraph styles to PDF tags. Part II starts with the finished InDesign document, exports it to a PDF, and show how well all the new InDesign CS5.5 features pay off in Acrobat X Pro. It also demonstrates how to further speed up the process using Actions in Acrobat X Pro. If you watched the accessibility video I did last year, using CS5, you’ll be amazed how much work has been done by the InDesign team to take all the pain out of the process and enable real communication between InDesign and Acrobat. OK…this has nothing to do with InDesign, but I had to let you all know that today — nearly 11 weeks early — our twin sons Ian and Declan joined the world. For preemies, they came out feisty and they’re in wonderful medical hands until we can hold them in our own. 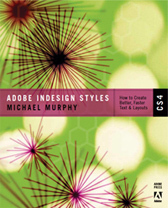 My exhaustive review of InDesign CS5 went live on CreativePro.com today. It’s a detailed, feature-by-feature exploration of the new version. complete with a sample SWF animation and SWF slideshow created in in IDCS5, three short videos demonstrating cool new transformation features and, of course, the usual less-than-subtle use of baby photos. If you want to know what’s new and whether or not it’s time to upgrade, this review tells you everything you need to know. Launch day for Adobe’s Creative Suite 5 is here, and so is my first podcast episode dedicated to the newest version of InDesign. In this episode, I take a look at a number of very cool new features in InDesign CS5. There’s a lot more (see the full list below), but I’ve focused on some of my favorites, including span/split-column paragraphs, multiple page sizes, simplified transformations, metadata captions, the new Layers panel, and animation features (hinted at in my last post). This episode is kind of a a long one, but I’ve included chapter markers so you can quickly jump to the section of the episode (there are five demo segments) you want to see. Watch the episode here (36:46 | 70.1MB), or you can subscribe via iTunes. See this animation? I know what you’re thinking…Illustrator to Flash, right? What I can tell you now is that the animation above was created entirely in Adobe InDesign CS5. I can’t, however, say how I did it. 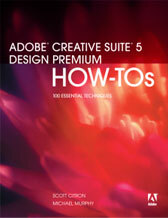 InDesign CS5 is still under wraps until Adobe’s April 12, 2010 launch, so the lid remains nailed down tight on specifics. But I’ve been part of the beta testing program, and Adobe has allowed some pre-launch glimpses into what CS5 can do (just not how to do it…yet). This was originally a print layout created in InDesign CS3. Without opening any other application, I was able to use InDesign CS5 to give this static print layout a new life on the web. One file. One application. Two publishing destinations. Sweet! I welcome everyone’s comments and reaction to the above animation, but if you have specific questions about it, be advised that I’ve said everything I can about it right here in this post. Refresh the page to see the animation play from the start again, or you can view a larger version on YouTube. Checkboxes and radio buttons and comb fields…oh my! After the podcast’s longest hiatus ever, and a cliffhanger gap worthy of The Sopranos, The InDesigner returns with a new episode that (finally!) finishes off the topic of designing smart for Acrobat forms. In this episode, I take a look at adding form elements to an InDesign layout to create Acrobat-friendly checkboxes, radio buttons and comb fields, all of which can be achieved with a little help from anchored objects, GREP find/change and tables. You may also notice new feature added to the podcast starting with this episode: chapters. You can now jump right to a specific part of the lesson using the chapters built into the video file. Watch the episode here (15:30 | 45.5MB), or you can subscribe via iTunes. My first course for Lynda.com—InDesign CS4: Learning GREP—is now live on the Online Training Library. This 3-hour, 45-minute title is the first comprehensive, video-based course to be offered about using GREP specifically in InDesign. Starting with an explanation of what GREP is, and how to write expressions using metacharacters, InDesign CS4: Learning GREP covers both GREP Find/Change (CS3 and CS4), and GREP Styles (CS4) in depth. Viewing the full course requires a paid Lynda.com account. However, 9 of the movies in the course are available for non-members to preview. For a 24-hour free pass to the Online Training Library, click here.